We recently caught up with Javier Zamora, owner of JSM Organics Farm and a leading voice in his local organic community. Javier, whose father was a farmer, started farming at age 11. Nowadays, Javier employs 25 workers full-time on the farm he named after his mother, Javier Sanchez Medina. Under Javier's watchful, disciplined crop planning and attention to soil health, he and his crew dedicate themselves to growing a diversity of plants and rotating their crops, to produce the highest quality, certified-organic strawberries, raspberries, blackberries, vegetables, and cut flowers. Chef Frank Giglio had not heard much about the field of plant breeding until he and his wife Camille moved to Three Lily Farm, the education and retreat center they run on 26 acres in rural Thorndike, Maine. Since meeting Emily Rose Haga, Johnny's tomato and pepper breeder, Frank is now one of the first people to be introduced to many of the new varieties bred by Johnny's, helping us test their culinary potential before they hit the market. Here are a couple novel recipes from Frank's kitchen using two of our newest bred-by-Johnny's varieties as ingredients. While growers by nature are an independent lot, the majority of us can name at least one individual who sparked our desire to grow things. Among key influencers, Martha Stewart's name appears high on the list of those from whose books millions of us have torn many a page. Through a longstanding partnership, Johnny's shares its seeds, tools, supplies, and expertise with Martha Stewart and her gardening team. A group of us were recently invited to visit her historic farm in the Hudson River Valley, New York. Here is a recap and photos of our tour of the grounds and garden led by head gardener, Ryan McCallister. In addition, Martha graciously gave us insight into how she herself became a lifelong gardener, as well as some thoughts on what gardeners all share in common. As 2013 drew to a close, so, too, did Johnny's 40th Anniversary. As a mark of gratitude we wanted to direct the spotlight onto our customers, who make our success possible. Over the year we profiled some of our core customers — fresh-market farmers — engaged in diverse business models. Our profiles include growers who sell at farmers' markets, those who sell on the farm, and those who sell only wholesale. We profiled farms that specialize in a few crops and some that grow everything under the sun. We featured two growers on opposite ends of the continent who run their own restaurants, and even interviewed an American abroad who is bringing that most American of crops — the pumpkin — to Sweden. In reflecting on our anniversary, we were humbled anew by the creativity and expertise that Johnny's customers bring to the profession of market farming. We thank all growers who participate in our cooperative programs and profiles, both for their time and their willingness to share advice with others in our business. We hope these stories help educate and inspire farmers who want to try new crops, explore new methods, pursue new markets. Whether we've worked together with you for decades or have yet to meet, we're honored to grow with you! The first of our anniversary Grower Profiles highlights the work of Daniel Price and Ginger Dermott, owners of Freedom Farm, in Freedom, Maine. Daniel and Ginger share with us their expertise in growing chiles and sweet peppers, some insights into how they've developed their distribution channels, and their advice to aspiring growers. Our February Farm Visit was with a grower consortium based in Denver, Colorado. Circle Fresh Farms has developed an innovative marketing arrangement in which regional farms work together to provide year-round availability of certified-organic, hydroponic-greenhouse tomatoes, cucumbers, and lettuce. Thanks to its success in the Denver metro area, Circle Fresh Farms is thinking about taking its model to at least two other cities later this year and expanding from there. About 5 years ago, assessing the amount of work they were doing in the garden, the Kilgus family decided it was time to either get serious about market farming — or give it up. They got serious. Today they operate Living Water Farms in Strawn, Illinois, which consists of 9000 square feet of hydroponic greenhouse production. Mark Daniel started his melon business in his junior year of high school, growing 5 acres of watermelons on his family's row crop farm in southwestern Georgia. He set up a pile of watermelons under a pecan tree on the side of a busy state highway and called his business Mark's Melon Patch. To a 17-year-old, the money was great. Thirty-two years later, Mark's Melon Patch is still located under that same pecan tree, but it's a much different operation. He now has a permanent market that is open year-round. He still grows melons, and lots of them, but he now has 70 acres in production of a wide array of crops including sweet corn, watermelons, cantaloupes, blueberries, okra, peanuts, pecans, and pumpkins. The crops in question are actually American favorites — pumpkins and winter squash. Louie grows them in Sweden, where he moved from the US in 1972 to work as a plant breeder of cereal crops. He, his wife, Myra and their daughter have continued to live in Sweden since then. For 25 years, Paul and Sandy Arnold have been steadily but sustainably adding and expanding, year after year. 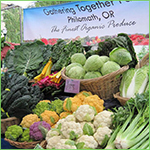 When Frank and Karen Morton arrived in Philomath, Oregon, in 1987 to look for farmland, the first growers they met were John Eveland and Sally Brewer, who were in their first season of market farming at Gathering Together Farm. The Mortons bought a farm five miles away, and the two couples became good friends and organic farming collaborators. Their greens are available year-round. Everything they sell is a living product with roots attached. Defining their business by those three characteristics makes it sound like a simple recipe for success. But in fact, their greenhouse operation in Strathroy, Ontario is a complex system developed over more than 25 years. Growing greens of all sorts and catering to various markets within the Toronto metro area, their production system is a hybrid of hydroponics and soil culture, something they have been refining over the years. "We're using a lot more soil than most hydroponic greenhouses because we sell everything with roots attached," Jo Sleger explains. Subirrigating with an ebb and flow system, the organic hydroponic system "is the single most difficult thing we do," states Jo. "It's more than twice as difficult as conventional hydroponics…"
Growing Power, a renowned urban farm and training center based in Milwaukee, Wisconsin, works to provide equal access to healthy, high-quality, safe and affordable food. Growing in winter is an essential part of its mission. "Eating healthy food for six months of the year or less is not the answer," says Will Allen, founder and CEO of Growing Power. "I believe the answer is eating healthy food 365 days a year. And the only way to do that is to extend the season to 365 days a year." How Growing Power achieves that underscores the validity of an emergent form of sustainable agriculture referred to by some as "polyculture." To be able to grow year-round at its farms in Milwaukee, Madison, and Chicago, Growing Power has devoted 25 acres to greenhouses and hoophouses. In the heated greenhouses, growers raise fish and vegetables in an aquaponics system. In unheated hoophouses, they grow more than 40 kinds of greens all winter without burning any fossil fuels. Paradise Farms has become a big name on the food scene in South Florida, thanks to the energy and enthusiasm of owner Gabriele Marewski. Gabriele grows specialty produce for about 30 restaurants in the Greater Miami area. The chefs who buy her food collaborate with her in a series of on-farm dinners and brunches. She also offers "Weddings in Paradise" and a B&B farm stay, plus various retreats, workshops, and tours. This highly diversified farm of just 5 acres offers a model for other growers who, like Gabriele, have limited land but unlimited vision. Gabriele follows the principles of Biodynamics, and has always focused on selling to restaurants… Seven years ago we started having farm dinners. My ulterior motive with the dinners is to get the chefs to come down to the farm. When they come to the farm, they really get it; they understand the value of local food…"
For Peach Crest Farm in Stratford, Oklahoma, the busy season starts in late August, when school begins session. With 68 school districts as customers, Peach Crest Farm is absorbed with harvesting, packing, and shipping a wide array of produce…. All the way up until winter break, Peach Crest Farm will ship certified-organic produce and herbs to Oklahoma schools. Peach Crest Farm began as a 100-acre peach orchard owned and operated by Susan Bergen. Over the years, she bought an additional 230 acres of crop land near the orchard and expanded into vegetables. One of the first farms in Oklahoma to sell to schools, she recognized the huge potential of the Farm to School movement. Three years ago, she brought in James Cooper of Cooper Organics to manage the certified-organic side of the produce operation. James is the man who keeps it all moving — crop production, labor management, marketing, and shipping logistics. "When I came, the foundation was there to take the business to another level," he said. "Now I'd like to turn the Farm to School initiative into a year-round program…"
Four Town Farm on the Massachusetts–Rhode Island border is a true family business. Run by the Clegg family since its inception in 1900, Four Town today keeps seven fourth- and fifth-generation family members working full-time, producing vegetables on 200 acres for their retail farmstand. Four Town Farm is named for its location, where four historic New England towns conjoin: East Providence and Barrington, Rhode Island; and Seekonk and Swansea, Massachusetts. While originally run as a wholesale vegetable operation selling to supermarkets, in 1972 the family started up a retail operation that has since become the primary outlet for everything they grow. After more than 20 years of growing organic produce at Selwood Green, their farm overlooking the Bay of Fundy, Norbert Kungl and his family took their love of good food to another level. In 2011, they decided to open a year-round produce market and café in Halifax, Nova Scotia, 60 miles southeast of the farm. Several circumstances contributed to this decision. Norbert had suffered an injury that made farming a lot more difficult. Around the same time, the Halifax farmers' market, where he has been a keystone vendor for many years outgrew its building. An opportunity arose to provide a permanent home for the ever-popular farmers' market in a rehabbed warehouse on the harbor. The area was being developed into a cultural district, with a museum and public spaces, in an effort to attract locals and tourists alike. But the deal was contingent on having year-round businesses as well as the Saturday farmers' market. In our Farm Visits & Grower Profiles we take an in-depth look at leading growers' operations, covering such vital aspects as crop selection, distribution channels, growing practices, innovation in business models, and emerging agricultural trends. This series originated with the celebration of our 40th anniversary in 2013, during which we wished to acknowledge the spirit, intelligence, and integrity of our core customers, without whom our own success would not be possible. In our Farm Visits, we highlight the way customers cultivate a particular crop, use a specific tool or grower technology, or plan for, grow, and harvest in a unique or especially interesting way. In our Grower Profiles, we look at the entire operation of a specific grower. Join us as we share the insight and success stories of some of today's leading direct-market and small commercial growers.